Objective: The objective of this study is to measure the strain developed in the simulated bone around implants with different percentages of bone implant contact (BIC), namely 50%, 75% and 100%, with loads of 200, 400, 600, and 800 N. Materials and Methods: Thirty implant replicas of dimension 3.75 mm × 11.5 mm were mounted in simulated bone blocks of auto-polymerizing acrylic resin. The difference in the BICs was created by selectively covering the threaded portion with modeling wax. The wax used for covering the implant surface was eliminated by injecting hot water through sprues created in the resin blocks. Radiographs of the prepared acrylic blocks were taken to ensure different BICs. Metal-ceramic crowns were cemented over abutments. Strain gauges were bonded and static loads of 200, 400, 600, 800 N were applied using a universal testing machine. Data were statistically analyzed with factorial ANOVA. Results: An increase in strain was observed when the percentage of bone to implant contact increased. For specimens with 50% BIC, at 200 N load peri-implant strain of 42.8 με was recorded, and which progressively increased with increase to 94.02 με with increase in load to 800 N. For the specimens with 75% BIC, at 200 N load peri-implant strain of 208.9 με was recorded, which increased to 254.5 με when the load increased to 800 N. Similarly, for the specimens with 100% BIC, at 200 N load peri-implant strain of 347.02 με was recorded and this increased to 427.7 με when the load was increased to 800 N. Conclusions: An increase in BIC by 1.5 times, from 50% to 75%, resulted in an increase in peri-implant strain by 3.5 times. On the other hand, when BIC increased 1.3 times from 75% to 100%, an increase in peri-implant strain was 1.6 times. Insignificant effect of load on the peri-implant strain was observed when the load increased by 200 N. Rise in occlusal load by 400 N showed significant increase in the peri-implant strain. A direct relationship exists between the percentage of BIC, load applied and the peri implant strain. An increase in strain is observed when the percentage of bone to implant contact and the load applied on the implants increase. Higher degree of BIC results in better distribution of forces subjected to it. The strain generated indicates an effective transmission of load from the implant to the bone, but the load should always be limited to the ranges mentioned in the adapted window. Evolution of dental science has occurred in an attempt to find out a replacement of loss of teeth. All the attempts were directed to achieve a solid foundation of remaining teeth or the residual ridge. Although the replacements have satisfied the esthetic needs, during function they have overloaded the abutment teeth or the supporting tissues. Many of the treatment protocols have even invaded the integrity of healthy teeth to provide adequate functionality to the replacements. The introduction of dental implants as functional units was immediately accepted because of its similarity in morphology and biomechanics to the natural teeth. Primarily, the teeth were designed to receive functional loads and which got transmitted to the jaw bone and this in turn has helped in the successful maintenance of the bone. The functional design of implant was similar to the tooth with the only exception of the presence of periodontal ligament. For the long-term existence of a dental implant, the supporting bone should maintain an intimate contact with the implant surface. Titanium and its alloy provided the most appropriate biocompatible profile and the different types of surfaces achieved through intense research has ensured the most intimate bone implant contact (BIC). The design of the implant has also been optimized in due course so that the biomechanics could be brought to the range of predictability. Bone behavior against functional loading has also been studied extensively so that the physiologic limits to which bone can be stressed has been found out. Surgical skills have been level up and optimized in the recent past and that has contributed largely to implant success. By defined understanding, a successful implant should maintain intimate contact with bone and which is marked as a sign of osseointegration., The architecture of jaw bone varies in density and pattern, and that can limit BIC to different proportions. The functional load will always remain appropriate to the needs, but it cannot be optimized, especially in relation to the human jaw. The masticatory load measured with natural teeth varies with different published documents. The load transmission capacity of the bone-implant interface has received much attention of researches in the recent past. However, the studies were always limited with the use of simulated environments. As long as, human experiments remain impractical we should rely on virtual or a actual simulated environments. The question very often raised in the mind of the implantologist is on the load transmission capacity if there is a large variation in the BIC area and that can happen due to physiologic or pathologic reasons. Simulating different proportion of BIC has always posed a challenge and very rarely solutions have been found out in the literature. The present investigation was thought of in this context to measure the strain developed in the supporting bone of an implant with various proportions of BIC. The objective of this study is to measure the strain developed in the simulated bone around implants with different percentages of BIC, namely 50%, 75%, and 100%. 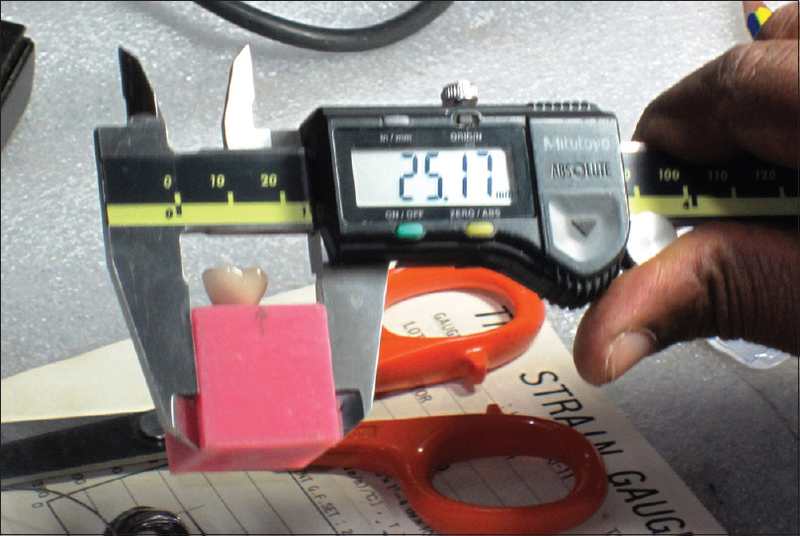 To measure the strain developed in the simulated bone around implants with different occlusal loads, namely 200, 400, 600, and 800 N.
Thirty implant replicas of dimension 3.75 mm × 11.5 mm were mounted in simulated bone blocks measuring 25 mm × 25 mm × 25 mm. The blocks were made of auto-polymerizing PMMA resin. Three different types of BIC were designed, namely 50%, 75%, and 100%. The difference in the BICs was created by selectively covering the threaded portion with modeling wax. To simulate 50% BIC, 50% of implant surface was covered with wax [Figure 1]a, similarly, about 25% of the implant surface was covered with wax and embedded in acrylic to simulate 75% bone contact [Figure 1]b. Nearly 100% BIC was achieved by completely embedding the implant in acrylic resin without any wax covering [Figure 1]c. The wax used for covering the implant surface was eliminated by injecting hot water through sprue created in the resin blocks. The sprue was made by incorporating 19G wire during the mold preparation of the acrylic block. 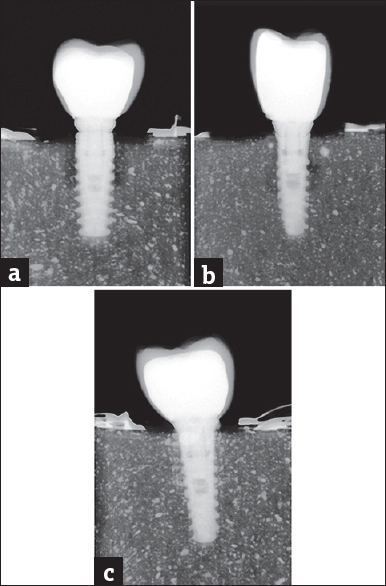 Radiographs of the prepared acrylic blocks were taken to ensure different BICs [Figure 2]a,[Figure 2]b,[Figure 2]c. To make the acrylic radiopaque, barium chloride (5% w/w) was added in the acrylic powder. Abutments were connected to the embedded implant and on this assembly metal ceramic crowns were cemented. Strain gauges (350 Ω, gauge factor 2.01, Tokyo Sokki Kenkyujo ltd, Japan) were bonded adjacent to the buccal and lingual sides of the implant. For bonding of the strain gauges, the specimen size was first standardized using a digital vernier caliper (Mitutoyo, Tokyo, Japan) so that the dimension of 25 mm × 25 mm × 25 mm was ensured [Figure 3]. The surfaces of the specimens were made flat, polished, and were cleaned using isopropyl alcohol (Excel, Bhiwandi, India). Strain gauges (350 Ω, gauge factor 2.01, Tokyo Sokki Kenkyujo ltd, Japan) were bonded adjacent to the specimen using cyanoacrylate glue (CN adhesive, Tokyo Sokki Kenkyujo ltd, Japan). These were then connected to the strain indicator (Test builder v2.3) by soldering the terminals of the strain gauge, using silver solder. Static loads of 200, 400, 600, and 800 N were applied at the central fossa of the metal ceramic crown using a universal testing machine (Nano plug and play-ISN 67, Illinois tool works, USA) using a stylus of 0.8 mm diameter [Figure 4]. The strain developed was measured in the digital strain indicator connected to the specimen. Highest microstrain value was seen when specimen with 100% BIC was subjected to 800 N load. The microstrain recorded was 254.5 με with 75% BIC and 427.7 με with 100% BIC under load of 800 N. Mean microstrain (με) value recorded in specimens with 50% bone was 94.02 με with 800 N load [Table 1], [Table 2], [Table 3]. Factorial ANOVA was used to statistically analyze the results obtained [Table 4]. Higher mean microstrain was recorded in 100% BIC followed by 75% and 50% BIC, respectively. The difference in mean microstrain between the three BICs was found to be statistically significant (P > 0.001). Among the four different loads, higher mean microstrain was recorded in 800 N followed by 600, 400 and 200 N, respectively. The difference in mean microstrain between the different loads was found to be statistically significant (P > 0.001). Multiple comparison between groups revealed that the difference in mean micro strain was found to be statistically significant between 50% and 75% (P > 0.001), 50% and 100% (P > 0.001) as well as 75% and 100% (P > 0.001) [Table 5]. The difference in mean microstrain was found to be statistically significant between 200 and 600 N (P > 0.01), 200 and 800 N (P > 0.001) as well as 400 and 800 N (P > 0.01). No significant difference was observed between 200 and 400 N, 400 and 600 N as well as 600 and 800 N (P > 0.05) [Table 6]. 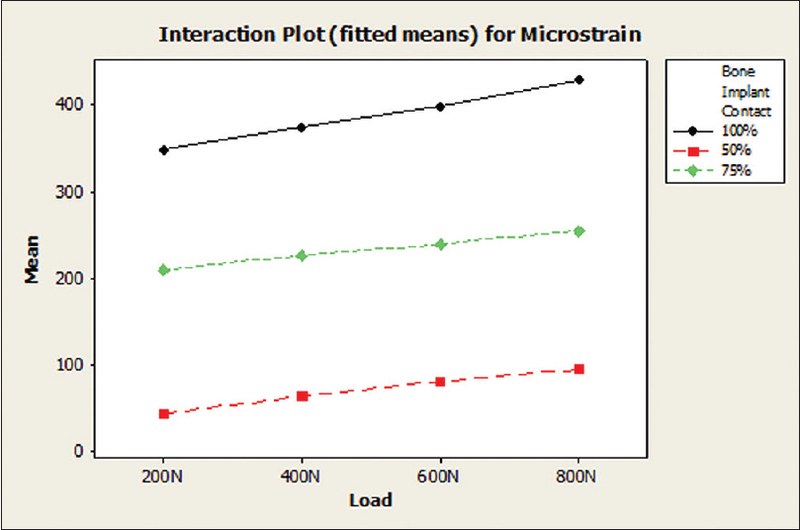 Main effect plot and interaction plot shows the microstrain with different factors [Figure 5] and [Figure 6]. Primary difference between natural teeth and dental implant is the presence of the periodontal ligament. The periodontal ligament allows bodily movement of teeth during function, a phenomenon that is not observed with implants. Mechanoreceptors present in the periodontal ligament control the forces of mastication. Reduction in the periodontal support may result in loss of mechanoreceptors as well. With dental implants, this mechanism of controlling the biting force is either negated or greatly reduced. Natural teeth and implants are subjected to cyclic loads during mastication. The supporting bone is not very tolerant to cyclic loading. To However, the presence of periodontal ligament protects the supporting bone by reducing the load on it. To counteract the problem of overloading in dental implants, a higher degree of osseointegration is required. Excessive dynamic load can trigger bone resorption and formation of triangular-shaped craters in the marginal bone. Bone by nature can adapt to the load applied on it with varying responses. Typically, bone adapts well to a strain ranging from 50 to 1500 με and functions well. This phenomenon is observed with dental implants. If the strain in the bone does not exceed 50 με, disuse of the bone occurs and remodeling results in a net loss of bone. A moderate increase from the optimal functional strains induces an increase in bone mass. Formation of dense bone surrounding the mechanically loaded implant is thereby explained. A higher bone to implant contact is also observed around implants that are subjected to functional load. Apposition of bone around an oral implant is due to biological response to the stress or to be precise due to the strain generated within the threshold of 1500 με. Loss of marginal bone or complete loss of osseointegration may be the result of mechanical stress beyond this threshold. Overload is the primary cause of implant failure. When an implant is subjected to occlusal load, axial force is tolerated more effectively than lateral force. When an implant is loaded, the highest stress is therefore seen in the most coronal portion of the supporting bone and resulting in bone loss. Crestal bone loss of 1 mm in the 1st year after implant placement and 0.1 mm in subsequent years is acceptable for a successful implant. Lack of bone to implant contact caused by occlusal overload may also favor epithelial downgrowth. This ingress of epithelial attachment may affect the peri-implant with periopathogenic microorganisms and which can further contribute to bone loss. However, it is noted that failure of the implant as a result of bone loss is not seen provided 50%–65% of BIC is maintained. Success of implant is determined by the area of the implant surface in intimate contact with mineralized bone tissue as well as the mechanical quality of bone tissue around the interface. It is observed that more bone to implant contact is present at the compressive side when compared to tensile side in mechanically loaded implants., When a completely osseointegrated implant is loaded, maximum stress is seen at the cervical cortex. This occurs as a result of the transfer of compressive, tensile and shear stresses. On the other hand, when partially osseointegrated implants are loaded, stress at cervical cortex is very low because it has only compressive component to transfer. In addition, partially osseointegrated implants do not make adequate contact with bone to dissipate the stress. An even load distribution is observed with completely osseointegrated implants. Primary implant stability is dictated by the BIC ratio. More bone contact with implant surface is believed to be the basis of higher implant stability. Increased initial stability is indicative of higher resistance at bone-implant interface and that could decrease micromotion of the implant. This reduction in micromotion might improve osseointegration and reduce the risk of failure. Considering the importance of bone-implant interface, numerous studies have been done to evaluate the effect of various parameters at the interface. Animal studies, have shown that implants can better resist static occlusal load than dynamic loads. In addition, the frequency and amplitude of the load applied on the implant is considered more important than the strain generated. Low frequency and high amplitude load results in better stimulation of underlying bone resulting in remodeling. Limitations of performing animal studies are difficulties in simulating the clinical situation as well as difficulties in procuring the test specimen. Finite element analysis (FEA) has been used to evaluate the effect of different percentages of bone to implant contact on the biomechanical response of the bone. Limitation of FEA is the fixed value assigned to the model and inability to simulate actual clinical environment. Simulated bone models using acrylic resins have been successfully used to study the effect of load direction at the bone-implant interface. Acrylic resin can be considered as a suitable material to replicate bone. The elastic modulus of autopolymerizing acrylic resin is 1700 MPa which is closer to that of bone (1500 MPa). Acrylic resin can be used conveniently to fabricate specimens to simulate different percentage of BIC. For the current study, the difference in the BIC was created by covering the surface of implant with wax. To simulate 50% BIC, 50% of implant surface was covered with wax. Similarly, to simulate 75% BIC, 25% of implant surface was covered with wax, and for 100% BIC, implant was embedded as such in the acrylic block. The wax was eliminated by introducing warm water through sprue channels made in the specimens. After the specimens were prepared, metal ceramic crown was cemented on the abutments. Strain gauges were attached on the buccal and lingual aspect close to the implant and the crowns were subjected to different loads. Subjecting the implant prosthesis to different loads and subsequently measuring the peri-implant strain through strain gauge is relatively a simple procedure. Fabrication of specimens with different percentages of BIC using wax elimination method has not been reported before. The experiments were conducted on specimens with three different types of BIC, namely 50%, 75%, and 100%. Specimens were then subjected to four different types of loads, namely 200, 400, 600, and 800 N. For specimens with 50% BIC, at 200 N load peri-implant strain of 42.8 με was recorded, and which progressively increased with increase to 94.02 με with increase in load to 800 N [Table 1]. For the specimens with 75% BIC, at 200 N load peri-implant strain of 208.9 με was recorded, which increased to 254.5 με when the load increased to 800 N [Table 2]. Similarly, for the specimens with 100% BIC, at 200 N load peri-implant strain of 347.02 με was recorded, and this increased to 427.7 με when the load was increased to 800 N [Table 3]. These findings suggest that an increase in strain was observed when the percentage of bone to implant contact increased. In a similar manner, the peri-implant strain increased with increase in the load applied. Similar findings were observed with FEA, where greater stresses and even distribution of load was seen when there was an increase in the percentage of BIC. Difference in BIC, namely 50%, 75%, and 100% was simulated because, an acceptable range of bone to implant contact to ensure success is said to be 50%–65%, but a higher percentage of contact is always desired. Studies have proved that higher degree of BIC results in better distribution of forces subjected to it. Hence, the effect of higher BIC on the peri-implant area had to be evaluated. Variations in the occlusal loads, namely 200, 400, 600, and 800 N were tried so as to simulate occlusal loading conditions in the oral cavity. The occlusal forces in the anterior region of the dentition are in the range of 200 N whereas, in the posterior region, it is in the range of 800 N. Observations from the current study revealed that an increase in BIC resulted in increase in the peri-implant strain. An increase in BIC by 1.5 times, that is from 50% to 75%, resulted in an increase in peri-implant strain by 3.5 times. On the other hand, an exponential increase in peri-implant strain by only 1.6 times was noted when BIC increased 1.3 times from 75% to 100%. 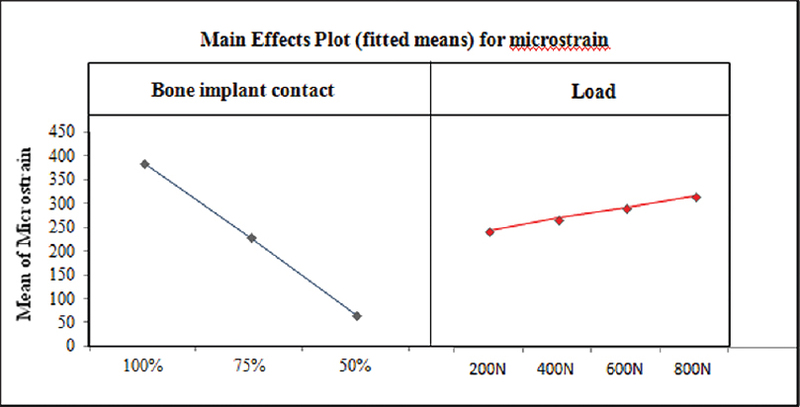 It was also observed that peri-implant strain increased with increase in the load applied. However, it was noted that, increase of load by 200 N did not have significant effect on the peri-implant strain. Significant rise in the peri-implant strain with increase in load was observed only when the load increased by 400 N. These findings suggest a direct relationship exists between the percentage of BIC, load applied and the peri-implant strain. In addition, the strain generated indicates an effective transmission of load from the implant to the bone; however, the load should always be limited to the ranges mentioned in the adapted window. BIC of 100% showed that the maximum peri-implant strain. Least peri-implant strain was observed with 50% BIC. Occlusal load of 800 N produced the maximum peri-implant strain and least peri-implant strain was observed with 200 N of occlusal load. Insignificant effect of load on the peri-implant strain was observed when the load increased by 200 N. Rise in occlusal load by 400 N showed significant increase in the peri-implant strain. An increase in BIC by 1.5 times that is from 50% to 75%, resulted in an increase in peri-implant strain by 3.5 times. On the other hand, an exponential increase in peri-implant strain by only 1.6 times was noted when BIC increased 1.3 times from 75% to 100%. Tada S, Stegaroiu R, Kitamura E, Miyakawa O, Kusakari H. Influence of implant design and bone quality on stress/strain distribution in bone around implants: A 3-dimensional finite element analysis. Int J Oral Maxillofac Implants 2003;18:357-68. Brunski JB. 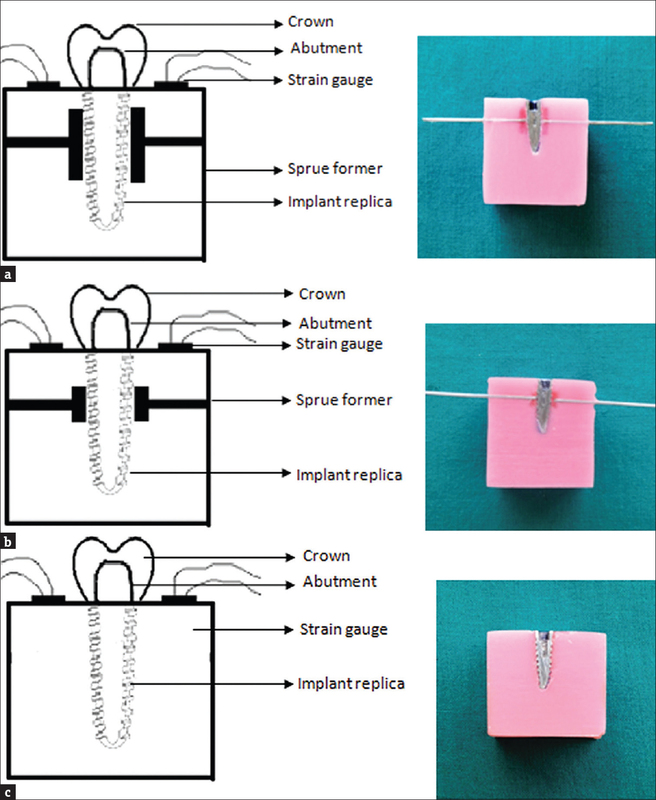 In vivo bone response to biomechanical loading at the bone/dental-implant interface. Adv Dent Res 1999;13:99-119. Petrie CS, Williams JL. Probabilistic analysis of peri-implant strain predictions as influenced by uncertainties in bone properties and occlusal forces. Clin Oral Implants Res 2007;18:611-9. Isidor F. Influence of forces on peri-implant bone. Clin Oral Implants Res 2006;17 Suppl 2:8-18. Mathieu V, Vayron R, Richard G, Lambert G, Naili S, Meningaud JP, et al. 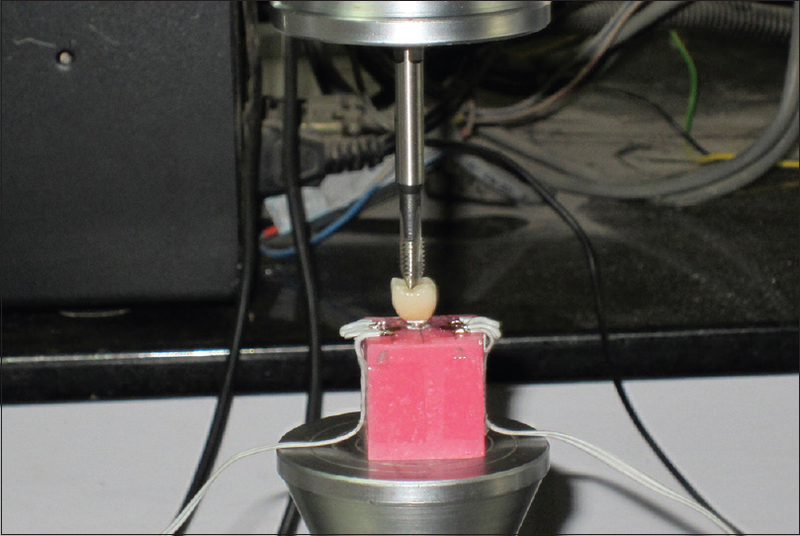 Biomechanical determinants of the stability of dental implants: Influence of the bone-implant interface properties. J Biomech 2014;47:3-13. Koc D, Dogan A, Bek B. Bite force and influential factors on bite force measurements: A literature review. Eur J Dent 2010;4:223-32. Kurniawan D, Nor FM, Lee HY, Lim JY. Finite element analysis of bone-implant biomechanics: Refinement through featuring various osseointegration conditions. Int J Oral Maxillofac Surg 2012;41:1090-6. Duyck J, Rønold HJ, Van Oosterwyck H, Naert I, Vander Sloten J, Ellingsen JE, et al. The influence of static and dynamic loading on marginal bone reactions around osseointegrated implants: An animal experimental study. Clin Oral Implants Res 2001;12:207-18. Gotfredsen K, Berglundh T, Lindhe J. Bone reactions adjacent to titanium implants subjected to static load. A study in the dog (I). Clin Oral Implants Res 2001;12:1-8. Van Oosterwyck H, Duyck J, Vander Sloten J, Van der Perre G, De Cooman M, Lievens S, et al. The influence of bone mechanical properties and implant fixation upon bone loading around oral implants. Clin Oral Implants Res 1998;9:407-18. De Smet E, Jaecques SV, Jansen JJ, Walboomers F, Vander Sloten J, Naert IE, et al. Effect of constant strain rate, composed of varying amplitude and frequency, of early loading on peri-implant bone (re) modelling. J Clin Periodontol 2007;34:618-24. Rungsiyakull P, Rungsiyakull C, Appleyard R, Li Q, Swain M, Klineberg I, et al. Loading of a single implant in simulated bone. Int J Prosthodont 2011;24:140-3. Lian Z, Guan H, Ivanovski S, Loo YC, Johnson NW, Zhang H, et al. Effect of bone to implant contact percentage on bone remodelling surrounding a dental implant. Int J Oral Maxillofac Surg 2010;39:690-8. Huang HL, Tsai MT, Su KC, Li YF, Hsu JT, Chang CH, et al. Relation between initial implant stability quotient and bone implant contact percentage: an invitro model study, Oral Surg Oral Med Oral Pathol Oral Radiol 2013;116:e356-361. Hsu JT, Huang HL, Chang CH, Tsai MT, Hung WC, Fuh LJ, et al. Relationship of three-dimensional bone-to-implant contact to primary implant stability and peri-implant bone strain in immediate loading: Microcomputed tomographic and in vitro analyses. Int J Oral Maxillofac Implants 2013;28:367-74.